Is it easier to grab an apple or ice cream before class? It’s a pretty common scene at campus Dining Halls across America: A student walks in, fully intending to eat a healthy, well-balanced meal. However, the limited options and lack of fresh fruit or vegetables, make it difficult to put that intended meal together. It’s easy for that student, who so badly wanted to eat healthy, to simply opt for pizza instead. But should this really be a surprise? Here at Keene State College, many of us are bound to campus dining due to a required meal plan or simple convenience. Constantly eating in the Dining Commons with its limited selections can pose all sorts of obstacles for students. College dining halls across the United States of America can get a bad rap, sometimes deservedly so. Meal plans are expensive and food choices are often limited, especially for those who are gluten free, vegan or vegetarian. The limited hours of the dining hall can also make it challenging for students. 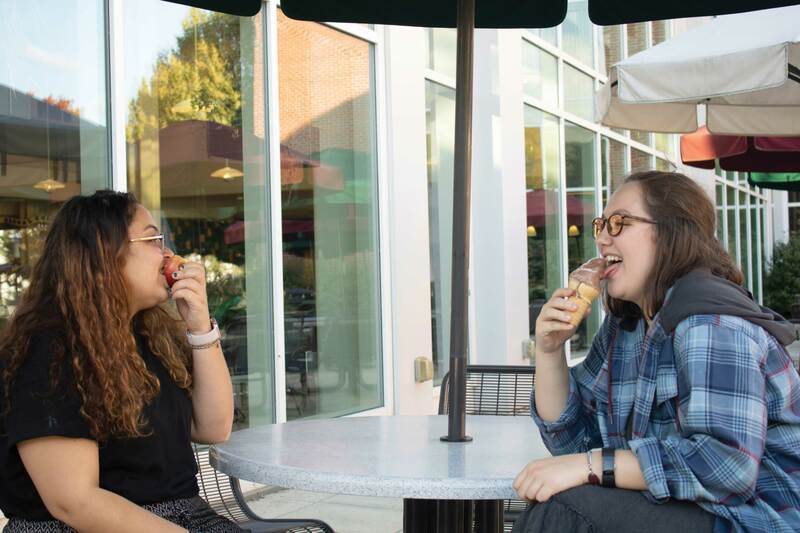 On weekdays, the Dining Commons is open from seven a.m. until eight p.m.—although they tend to lock the doors and stop letting students in between 7:30 p.m. and 7:45 p.m. This can prove difficult for students who have a six o’clock class. Students who aren’t able to make it to the Dining Commons may be able to use Hoot & Scoot to pick up a meal. However, if they have already used up their swipes for the week, or if there is nothing they like available, they are simply out of luck. This leads many students to order takeout or delivery, which isn’t good for their wallet or their body. The gluten free station at KSC isn’t much of a “station”. The area consists of a mini-fridge and microwave. Although the available options can sometimes vary, the lack of choices can be frustrating to students that have to abide by a gluten free diet. Although it can be challenging for some students to eat in the Dining Commons during the week, it’s often even harder on the weekends. Stir-fry and Vegan Valley are closed most weekends, making it more difficult for students to find healthy options. This also limits what vegetarians and vegans can eat on the weekends, often meaning they need to opt for pizza or pasta instead. And although the salad bar is always an option, the limp-looking greens and measly tomatoes are often not very appetizing. As a result, instant ramen, vending machines and takeout have become a staple across campus. However, these are often not very healthy options either. Vending machines are loaded with high-calorie, processed snacks with minimal to zero nutritional value. Takeout, such as pizza or Chinese food, is also highly processed and high in saturated fats and calories., Many students fail to realize the potentially serious effects of these unbalanced, highly processed diets. “The first problems associated with heart disease start in the early twenties,” said Melissa Wdowik, the Director of the Kendall Anderson Nutrition Center. She went on to explain that arteries may begin to harden in college students who lack proper nutrition and rarely eat fruits and vegetables. According to a study of student eating habits published in the Journal of Nutrition Education and Behavior, many students aren’t even eating one serving of fruit and vegetables a day — and according to the Center for Science in the Public Interest, a poor diet can also lead to a higher risk of heart disease, diabetes, obesity, high blood pressure and osteoporosis. However, all is not lost, Dr. Wdowik pointed out. Students can always improve their eating habits, even by making a few good choices each week. “The main thing a college diet lacks is fruit and vegetables,” she says. Wdowik recommends students try to eat a fruit and vegetable every day, if not with every meal. She points out that this is also much simpler than most students realize. A student could simply choose soup with some vegetables in it, or add them to a sandwich. Even one fruit or vegetable a day can lower your chances of developing nutritional-related diseases. To stay healthy, students don’t need to go on extreme diets or count calories. However, it is important to make good decisions about what they are putting in their bodies. Even changing a few of our eating habits can make students more energetic and productive.